No prices are listed. But these vehicles were not inexpensive. "At the very beginning of Nash Motors, C.W. Nash said, 'I will never build a cheap motor car.' Today, with more than a million Nash cars upholding that pledge, C.W. Nash repeats, 'I will never build a cheap motor car.' With Nash, it continues to be ... Quality first, last and all the time!" 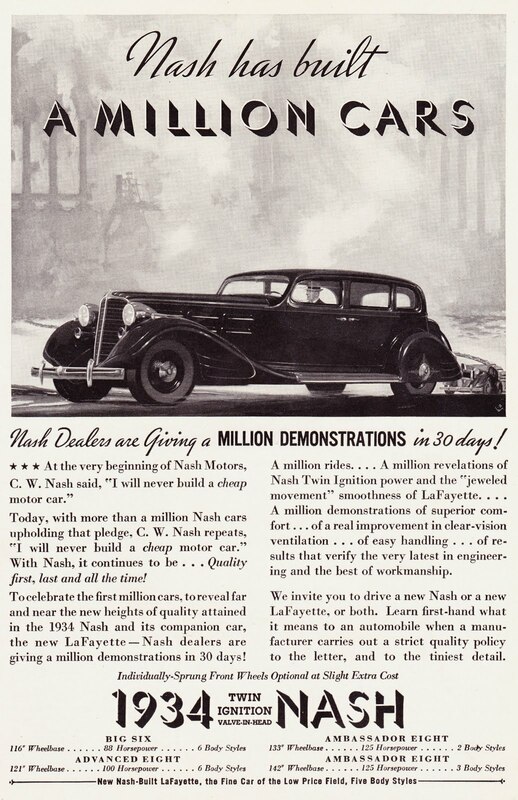 "To celebrate the first million cars, to reveal far and near the new heights of quality attained in the 1934 Nash and its companion car, the new LaFayette — Nash dealers are giving a million demonstrations in 30 days!" "Individually-Sprung Front Wheels Optional at Slight Extra Cost"
"New Nash-Built LaFayette, the Fine Car of the Low Price Field, Five Body Styles"
1. One of its final models was the Nash Rambler (1950-1954), which was produced by the Nash Motors division of Nash-Kelvinator Corporation. The Nash Rambler plays a key role in the plot of the 1958 song "Beep Beep" by The Playmates.